The next biennial automobile industry event --Auto Expo -- will be held in the second week of February next year, organisers said on Monday. The expo is scheduled from February 9-14, 2018 at India Expo Mart in Greater Noida, while the components show will be held at the Pragati Maidan, New Delhi from February 8-11, 2018. According to the organisers, the "Auto Expo - The Motor Show 2018" will be extended by one more day due to the rising interest and increasing footfalls of the visitors. 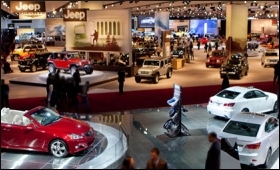 The "Auto Expo - The Motor Show and Components Show", are jointly organised by Society of Indian Automobile Manufacturers (SIAM), Confederation of Indian Industry (CII) and Automotive Component Manufacturers Association of India (ACMA). The "Motor Show 2018" will be spread across 185,000 sq.m. with all automobile majors participating in 14 indoor exhibition halls.